Brightly colored tulips create a cheery greeting for visitors to Muskogee's Honor Heights Park during the annual Azalea Festival each April. 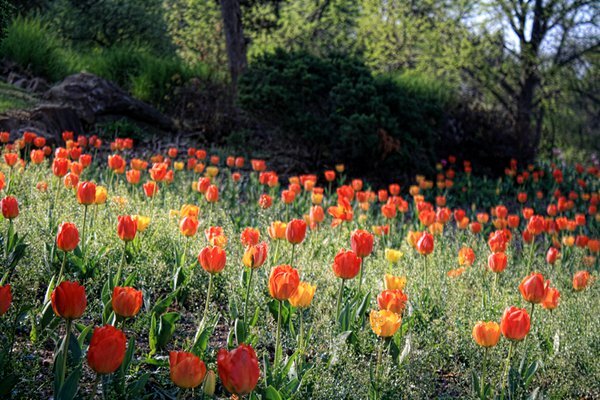 Gardens full of blossoming flowers, ripening berries along the vine and outdoor arts festivals are time-honored trademarks of Oklahoma’s spring season. From family picnics to lazy, peaceful days exploring the outdoors, spring in Oklahoma couldn’t be any more fun. Read on to discover 50 great ways to celebrate the state’s warmer weather and spring activities. Grab a picnic basket, choose your destination using our Ten Prime Picnic Spots in Oklahoma article and allow time for a long, relaxing lunch in springtime sunshine. Whether it’s a beautiful state park, a garden with spectacular sunset views or a creek bank teeming with life, each spot offers something unique. Spring is the perfect time to put on your shorts and sandals and take a trip to Sulphur to see one of Oklahoma’s most beautiful places. Dip your toes into the cool waters of the Chickasaw National Recreation Area’s streams and creeks and let the sunshine warm your skin as you relax on the bank next to Little Niagara. Each spring the Butterfly Garden at the Oklahoma City Zoo is brought to life with a vibrant display – hundreds of colorful butterflies flitting about the zoo’s 20,000 square foot walk-through exhibit featuring butterfly-friendly flowers and plants. You can also get your springtime butterfly fix at the Pontotoc Ridge Preserve, where over 90 species of butterfly have been documented. Line the streets of downtown Norman or Tulsa’s Blue Dome District to celebrate Mardi Gras in style. Raise your glass to the King and Queen of Mardi Gras during the Norman Mardi Gras Parade, or try to catch the bright purple, green and gold beads thrown from decorated floats during Tulsa’s Fat Tuesday event. A spring cookout wouldn’t be complete without an American picnic favorite: deviled eggs. 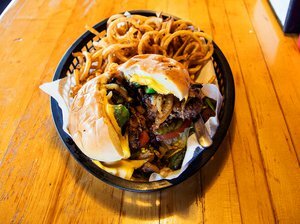 Luckily, Iron Starr Urban Bar-B-Q in Oklahoma City serves them up with delicious menu items such as pulled pork, smoked turkey and ribs. Just ask for Mama’s Deviled Eggs and feast on creamy eggs topped with peppers and fresh spring onion. The annual Easter EGGStravaganza at Foss State Park in Foss is a great way to have fun with the whole family while enjoying the warmer weather. Let the kids loose to discover Easter eggs before fueling up with a packed picnic or cookout lunch. Food is not included, but activities for the day include archery, disc golf, children's games and more. Spend Derby Day in Oklahoma City by attending one of Remington Park’s biggest parties of the year. Participate in the popular Derby Day Hat Contest by donning your most extravagant hat before enjoying live racing at the casino. Wrap up the afternoon with a simulcast of the exciting main event and a refreshing mint julep from Remington Park’s bar. Learn how science and nature interact by bringing the kids to explore Science Museum Oklahoma’s two-story treehouse in the GadgetTrees exhibit. Once you’ve climbed to the top, take a thrilling journey to the bottom of Archimedes Slide, known as the nation's tallest spiral slide west of the Mississippi. Book a room at the Stone Creek Bed & Breakfast in Broken Arrow for ultimate relaxation. Between enjoying their extensive breakfast menu in the morning and dessert hour each night, check out the sleeping porch equipped with a queen-size platform bed suspended in air. It makes the deck an ideal place for an afternoon nap or nighttime star gazing. 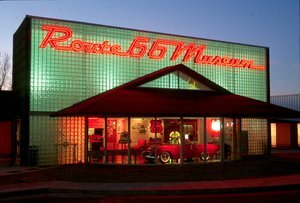 One of Route 66’s premier destinations and modern landmarks, POPS in Arcadia has more soda flavors than you can even imagine. Stop in to create a custom six pack of spring flavors including watermelon and pink lemonade before settling in for a delectable hamburger or chili dog in their Route 66-themed diner. Located in Elk City, Ackley Park’s main attraction is their full-size carousel. Dazzlingly lit and fun for the entire family, make an evening of taking a nostalgic spin while riding one of 36 hand-carved horses. You can also relax and ride in one of the carousel’s two chariots. While there, play a round of mini golf or have a picnic for the full experience. As the weather warms up and the camping itch begins to settle in, take on a new adventure and stay in a teepee at Roman Nose State Park in Watonga. Rentals are available beginning in April for this one-of-a-kind camping experience in one of Oklahoma’s original state parks. You can also rent a canoe, kayak, paddleboat or mountain bike for a full-fledged outdoor adventure. Take a break from cleaning out the garage and spend a day getting pampered at the Spa at Winstar located in the WinStar World Casino in Thackerville. Their Indulge package is a great way to unwind and includes a custom massage, custom facial and foot soak. This relaxing spa will have you back on the casino floor in no time. Whether you’re a novice at mountain biking or have been riding for years, the Turkey Mountain Urban Wilderness Area in Tulsa has a trail that’s right for you. Located just west of the Arkansas River, this beautiful area offers paths ranging from an eighth of a mile to just under six miles. If you’re feeling adventurous, branch out and explore nearly 25 miles of unmarked trails. Located near the calm waters of Grand Lake in northeastern Oklahoma, Lendonwood Gardens in Grove features seven themed areas with over 1,500 plant species. In the English terrace garden you’ll find rhododendrons and a katsura tree, while the colorful roses and zinnias in the American backyard garden are hard to miss. Don’t forget your camera so you can take pictures of the white gazebo and Angel of Hope statue. As an infinite number of delicate pink and white blossoms spring to life on thousands of area dogwood trees, Idabel celebrates with the annual Dogwood Days Festival. This spring tradition has it all including the chance to participate in a 5K run, barbecue cook-off and dance competition. Leave plenty of time to browse through craft vendors, let the kids enjoy games, check out live entertainment and feast on delicious food. The Sooner State celebrates this Irish holiday with a variety of block parties, parades and authentic pubs. Check out our Best St. Patrick’s Day Bashes in Oklahoma article and plan your outing to one of the great events happening around the state. Check out the St. Paddy's Party in Claremore that winds through the downtown area, and don’t forget to wear something green and have a pint of green beer while there. 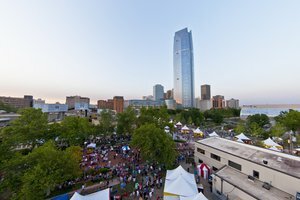 Spring has officially begun when hundreds of thousands of people gather in downtown Oklahoma City for the Festival of the Arts. Explore the work of over 140 artists in-between live music and cultural performances on four entertainment stages. Bring your appetite and feast on festival favorites including Indian tacos, sundaes, Italian nachos and drunken fries along the popular International Food Row. Reaves Park in Norman turns back the clock each April and transforms into a mini medieval village for the highly anticipated Medieval Fair. Knights mount their horses and challenge each other to a round of jousting while the aromas of smoked turkey legs and funnel cakes float on the breeze. Roam through 200 artisan booths and learn about medieval trades like blacksmithing. Using the beautiful Wichita Mountains Wildlife Refuge as a backdrop, a large cast of actors dramatically recreate the birth, life and death of Jesus Christ during the Holy City of the Wichitas Easter Passion Play. This Easter play, which has been in existence since 1926, is one of the longest running performances of its kind in the country. Each April, Honor Heights Park in Muskogee welcomes spring with the city’s annual Azalea Festival. Thousands of blooming flowers give the park vibrant color and beautiful views around every corner. Time your trip right and visit during the Cruizaders Car, Truck & Cycle Show or the Muskogee Chili & BBQ Cook-Off during the month-long festivities. The grass is green, the weather is nice and golfers have been waiting all winter for a chance to hit the fairway. For a sampling of Oklahoma’s can’t-miss courses, check out our Tee Time on Oklahoma Golf Courses article to get you started. With interesting landscape challenges, water hazards and gorgeous surroundings, each one offers a unique golfing experience. With impressive dedication to authenticity and family fun, the Castle of Muskogee welcomes thousands of people to its Renaissance Festival each May. Spend the day wandering through Castleton while taking in performances from jousters, jesters, fairies and pirates. Get lost in the Ultimate Maze, grab a pint of mead and attend the Queen’s Tea to have the chance to rub elbows with royalty. The city of Norman turns the downtown arts area into a huge outdoor venue for the annual Norman Music Festival. What began as a one day showcase of local music now draws national acts from across the country. Hundreds of local and regional bands keep the music going for three days in music venues throughout downtown Norman – all for free. The towns of Apache, Mangum, Waurika, Okeene and Waynoka all hold rattlesnake festivals each spring. At the Waurika Rattlesnake Hunt, have your picture taken with a live rattlesnake in their photo booth. The Mangum Rattlesnake Derby, Okeene Rattlesnake Round-Up and Waynoka Rattlesnake Round-Up all have carnivals while the Apache Rattlesnake Festival is known for its annual powwow. Downtown Oklahoma City’s Red Earth Native American Cultural Festival is one of the state’s biggest American Indian celebrations. Join 30,000 other attendees as you look at stunning Native American art, see traditional dancing and marvel at handmade regalia. Over 100 tribes are represented in the Red Earth Parade that travels through the downtown area on Friday morning. Located in Tulsa’s Blue Dome District, Juniper does dessert right with its batch of seasonal cobblers. Fresh berries are served with vanilla bean ice cream and cinnamon-maple glaze in a shortcake-style crust. It’s a decadent experience that is the perfect end to any meal. Go ahead and order your dessert with your entrée since these treats are carefully prepared and cooked to order. Each year spring brings cute baby animals to the Tulsa Zoo. From baby tortoises and monkeys to Red-billed Firefinch Fledglings and tiger cubs, the Tulsa Zoo has seen it all. Document the new babies’ growth with your camera while enjoying the gorgeous weather. Jump start your next home project, learn new DIY techniques or get landscaping tips at home and garden shows across the state. The OKC Home & Outdoor Living Show, Southwest Oklahoma’s Home & Garden Show in Lawton and the Rogers County Home & Garden Show in Claremore all have experts on hand to help spark your imagination. The spring growing season at Wild Things Farm in Pocola offers an abundance of fruits and vegetables that are ripe for the picking. Head out early in the day and start filling your containers with huge strawberries, delicious blackberries and juicy blueberries as well as fresh asparagus, cucumbers, eggplants and melons straight from the vine. Smell the blooming magnolia plants at the Magnolia Festival of Oklahoma in Durant, the Magnolia Capital of Oklahoma. Be sure to visit the arts and crafts vendors after enjoying the smell wafting through the trees, and watch the traditional Choctaw dancers, turtle races and fireworks display. The whole family can enjoy the Ferris wheel and other family-friendly fair food, carnival rides and games. 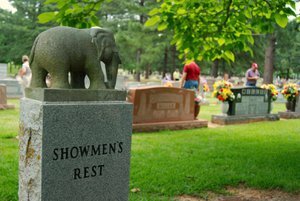 Every spring Shepherd’s Cross in Claremore sheers their sheep and welcomes everyone to their farm for two days of fun and entertainment. During Woolly Weekend, you’ll get the chance to observe “Sheep to Shawl” techniques as wool is taken directly from the sheep and turned into usable fabric. Shepherd’s Shop is open during this time for browsing through woolly products and other gifts. Everyone knows “April showers bring May flowers” and Oklahoma is no exception. While the state is known for extreme weather, you’ll actually enjoy moderate temperatures and over 300 days of sunshine a year here. Take a tour of Norman’s National Weather Center on the University of Oklahoma campus and learn about how Oklahoma’s geographic location plays a role in the climate of the heartland. This spring, go hiking to get your heart pumping and fill your lungs with sweet, fresh air. If you’d like to stay near a metropolitan area, the Martin Park Nature Center in Oklahoma City has over 140 acres to roam. To get in touch with nature, take a hiking trip and book a cabin at Robbers Cave State Park in Wilburton. Be sure to climb to the top of the San Bois Mountains for spectacular views. It’s hard to believe that all of the delicious food, fun events and exciting entertainment of the Stilwell Strawberry Festival are packed into one day. Visit the “Strawberry Capital of the World” to fill up on strawberries and ice cream, browse through vendors, ride carnival rides, see the crowing of the Strawberry Queen and experience the Strawberry Festival Parade and rodeo. Hit the open road and feel the wind in your hair during a scenic drive down the Wichita Mountains Scenic Byway. Wind through the Wichita Mountains Wildlife Refuge to enjoy this beautiful path that is full of color from wildflowers and rich with history. You may even see herds of American bison along the way. For one week during March the kids are out of school and the vacation possibilities in Oklahoma are endless. Narrow the list down a bit and check out our Spring Break Ideas for Families that have something for everyone. Take full advantage of the time off and road trip to a state park, head to a great family museum or see cute animals at a zoo. Beavers Bend State Park in Broken Bow is full of top notch places to set up camp and roast some hot dogs. This premier Oklahoma destination has over 50 tent sites in eight areas available to campers. Just bring your tent and pick a gorgeous spot with a view. Each area is within close proximity to the Mountain Fork River, Broken Bow Lake and other opportunities for hiking, biking and much more. See the Arbuckle Mountains that surround Davis from a unique vantage point with Air Donkey Zipline Adventure. The longest line on the course is also the longest zipline in the state at 1,700 feet. You’ll see rock quarries, mountains and more while dangling 60 feet up in the air. The Herbal Affair & Festival in Sand Springs is an opportunity to expand the spice and herb selections in your kitchen, but it is also so much more. Browse through over 80 vendors while sampling Indian, Polish Mexican, Cajun, Italian and Greek food. Top everything off with an Amish made cinnamon roll or pie and take in a lecture from an herbalist or a performance by bluegrass musicians. This May, let mom pick out her own gift for Mother’s Day and take her shopping at one of Oklahoma’ s best open air shopping malls. You’ll get to spend time together browsing through the merchandise at over eighty stores at the OKC Outlets. For an upscale shopping experience, Tulsa’s Utica Square carries high fashion retailers and gourmet restaurants. Eischen’s famous fried chicken put Okarche on the map. Make a trip to Oklahoma’s oldest bar and order from their no-frills menu for perfectly golden fried chicken that is served by the bird. Any picnic is only as good as the sides, and Ingrid’s Kitchen in Oklahoma City serves German potato salad that you’ll be raving about for a long time to come. The warmer weather of spring means drive-in movie theaters are welcoming patrons in by the car load. Tulsa’s Admiral Twin Drive-In opens near the beginning of April each year and shows blockbusters on their nine-story tall screens. Get your tickets for a double feature and plan on having a burger from the Admiral’s full kitchen, as well as some of their famous popcorn. Hundreds of thousands of people gather in downtown Tulsa to browse through beautiful art and take in everything Tulsa International Mayfest has to offer. Bring your appetite for festival food including corn dogs, fresh lemonade, gyros and other delicious goodies. With four indoor galleries, three stages of performing arts and the hands-on KidZone, it’s easy to see why Mayfest is a spring Tulsa staple. Tucked away in-between two trees that provide the perfect amount of shade, the Pecan Valley Inn Bed & Breakfast’s hammock is a peaceful and restful oasis. Plan your getaway to Davis and stay at this charming Victorian home conveniently located only a few miles from Turner Falls Park. The vibrant wildflowers that cover the property and the home’s wraparound porch set it apart from the rest. There’s no better place to hear over 200 species of birds sing their songs than the Hackberry Flat Wildlife Management Area & Center in Frederick. Greet the day with a hike around thousands of acres that are a haven for both waterfowl and other land dwelling birds that migrate back to Oklahoma in the spring. The Indian Creek Village Winery & Village Inn in Ringwood is an upscale bed and breakfast, as well as a fully functional winery. Before you retire to your beautifully decorated room, top off your evening with a decadent dessert and glass of sweet Oklahoma fruit wine – a special blend of strawberry, cherry, blackberry and pear. The spring breeze makes Oklahoma City’s Lake Hefner a great place for kite flying. See how high your kite can soar as you enjoy the unique features of this urban lake including the quaint lighthouse and magnificent sunsets. Take kite flying one step further and get out on the water. After two lessons with OKKite, you’ll be ready to feel the rush of kiteboarding around the lake. Bring your next family gathering to Lake Murray State Park for camping and an old-fashioned cookout. Those juicy hamburgers and hot dogs will taste even better cooked over an open flame using your campsite grill. 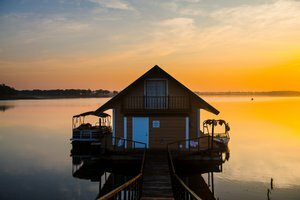 Lake Murray also provides plenty of space and opportunities for outdoor recreation including paddle boarding, ATV riding and more.